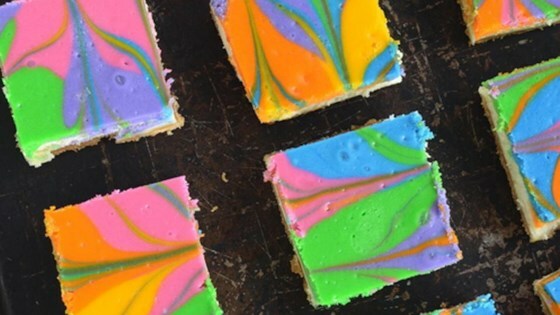 "Vanilla cheesecake cookie bars with a swirl of rainbow colors is a perfect dessert to serve for any party or event. It is easy to customize it to any theme. Store in a sealed container in the refrigerator." Preheat the oven to 325 degrees F (165 degrees C). Spray a 9x13-inch baking pan with cooking spray. Press crushed cookies into the bottom of the prepared pan to make the crust. Beat cream cheese and sugar together in a bowl using an electric mixer until creamy. Add eggs, sour cream, flour, and vanilla extract; beat until combined. Spoon 1/2 the batter into the prepared crust. Divide remaining batter evenly into 6 bowls. Add red, orange, yellow, green, blue, and violet food colorings separately to individual bowls until desired colors are achieved. Spoon colored batters onto the plain batter in a random pattern and swirl gently with a knife. Bake in the preheated oven until center jiggles just slightly, 40 to 45 minutes. Cool on the counter for 2 hours. Cover with plastic wrap and refrigerate for at least 4 hours; cut into 24 squares. In Step 4, do not over-swirl or put the knife in too far.